Since 1950, Don McNea Fire School's entry-level products and seminars have helped over 60,000 fire applicants attain that ultimate edge. The Ultimate Package provides you with the best tools for the entire entry-level examination process – the written, physical agility, psychological, and oral interview - to dramatically increase your chances of finishing in the top 5% to gain that coveted fire department badge. Don McNea Fire School’s Encyclopedia of Firefighter Examinations – Our number one selling entry-level written exam book! This book contains over 243 pages and over 500 questions, divided into 16 testing subjects common in today’s 21st Century firefighter exams. Capt. Bob's Becoming a Firefighter: The Complete Guide to Your Badge. This book is a step-by-step, everything you need to know about the process of becoming a firefighter, starting with the application, written, physical, oral, psych interview, background, polygraph and medical to help you gain that coveted badge. Capt. Bob’s Conquer the Job Interview – The number one oral exam prep in the country! Discover the inside secrets of interview ideas that have been tested, proven and worked for thousands of applicants who are now firefighters. The “nugget” oral interview principle enables applicants to personalize their presentations to separate them from cloned candidates. 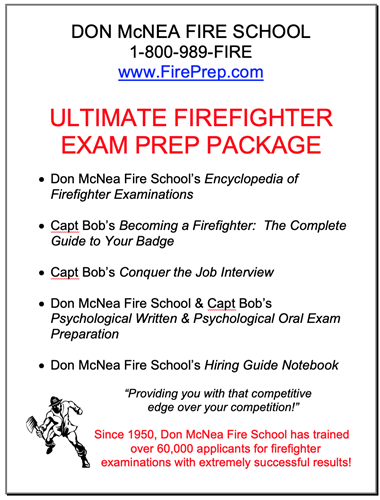 Don McNea Fire School & Capt Bob’s Psychological Written & Psychological Oral Exam Preparation – This program gives you the inside of what the psychologists are looking for in successful fire candidates. In this 40-page workbook, we examine over 80 questions from each of the key personality traits of a firefighter. With each question, we provide you with suggested answers and explanations to put you in the mindset of what the psychologists are looking for. Examination preparation strategies and our top-scoring test-taking strategies. FirePrep.com's fire department information sheets which allow you to keep track of phone numbers, addresses, test dates, special requirements, and other pertinent information you will need to prepare before the examination. List of the top 150 major fire departments including their addresses and phone numbers so that you can keep track of the most current exam information. Time and time again, research has shown that the top scoring applicants have a game plan. They are preparing well in advance for the written, physical agility, psychological, and oral portions of the examination as well as reviewing top scoring test-taking strategies that will give them an edge over their competition. You want every tool available to gain your fire department badge – we want to help! Why take one more test and be disappointed in the final outcome? You need to do a self-analysis on where you are in the process and tell yourself, "I want to dramatically improve my chances on all aspects of the firefighter exam process to put me in that coveted top 5 percentile today!" Now it's up to you - you can fall into two categories. One is the 90% of fire applicants who never prepare for an examination and are extremely disappointed in their results. Or, are you going to be in that 10% that starts preparing for the examination early and are confident, relaxed and ready to meet this very important testing challenge? That 10% represents most fire applicants that get the job - those that really want it! Remember that luck goes to the prepared!